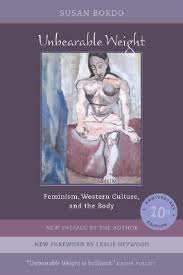 Susan Bordo’s Unbearable Weight: Feminism, Western Culture, and the Body (U of California Press, 1993) is put together by Bordo’s various lectures, talks, and published essays on the liberal feminist ideology that the female body is a cultural construct designed by Western culture—its prejudices and misconceived ideals—towards women and the place of their bodies. Women’s bodies, therefore, become the framework of the way we perceive women, the roles they play within our society, and how they even perceive themselves. As blank slates of cultural assignments, female bodies are defined by male perceptions of women—including their anxieties, fears, personal agendas, fantasies and prejudices. Bordo focuses on the historical and cultural perpetuation of female body images wherein “women and girls frequently internalize this ideology of holding themselves to blame …[which] festers into…shame over our bodies, and self-loathing (8). When culture begins to define bodies and what body types are ideal, the objects of these definitions begin to look upon their bodies as alien and imperfect. Assuming a “disordered” perception of themselves as flawed, eating disorders ensue, their bodies becoming the places of cultural influence and adaptation. This “disordered” lens through which women view themselves affects their “self-worth, self-entitlement, self-nourishment, and comfort with their own bodies…[and is] utterly continuous with a dominant element of the experience of being female in this culture” (57). 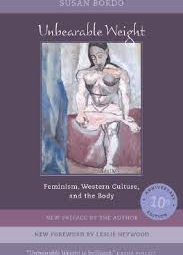 It is important to note that this book looks at women’s bodies as texts that have been inscribed upon and defined by cultural constructions of femininity. This includes body images of stick-thin models inundating our television sets, maternal bodies and the way we look upon women as mothers, as well as sick bodies like those who suffer with anorexia and bulimia. Eating disorders have consumed the female makeup of bodies as text in the same way hysteria consumed the nervous system of women in the Victorian Era. According to Bordo, anorexics who look in the mirror and see fat when the rest of us see skin and bones, do not “misperceive” their bodies; instead, they demonstrate an acceptance of the norm. They have “learned…the dominant cultural standards of how to perceive” their bodies (57). Sadly, women in our culture become the embodiment of social pressures as they allow cultural standards to define their bodies and their roles. Girls as young as 4 begin to associate the word “fat” with girls who do not look the part of the body images they are surrounded with. For example, Barbie, Disney Princesses, and all their other special dolls are all stick-thin. This also includes the thin girls they are bombarded with on television shows and commercials. Moms are always on special diets, and women as well as teens are obsessed with their appearance to the point of getting surgical procedures that will make them feel outwardly perfect. In our pursuit of these physical perfections, we are missing the fact that we are sending the wrong message to our girls—that they too have to maintain physical perfection and thinness that is far from realistic or ideal. We are harming, not only our selves and our own bodies, but also the self-esteem and body images of our daughters. If we are not happy with the way we are built, how can we teach them to be happy with their God-given flab? Or that flab is nothing to get wrapped up in. Moreover, we are subscribing to an ideal that is created for us and forced upon us. We are like sponges, assuming the rules that make us sick and misguided, filling us with self-loathing and doubt. In the same way that hysteria was used in the 19th-century to keep us docile, meek, and child-like, these same cultural definitions that tell us how much to eat by inundating us with young, beautiful, and hairless models of perfection are trying to convert us all into modern day Stepford Wives—thin, compliant, and obedient—the way we used to be. In assuming these cultural definitions, we are failing to be our authentic selves. We are someone else’s fantasy—unreal, plastic, and forced together by stitches. In the end, inside, we will always be unhappy, because we are not fulfilling our objectives, but the objectives of men who want us to be perfect-looking while they stay the same. While we starve ourselves, inject botox into our skin, have knives slice into our bodies, fat suctioned out, and needles sew our flesh back together as if we were foreign parts stitched together to form the perfect ensemble of feminine flesh, “requir[ing] containment and control…male indulgence is legitimized and encouraged” (14). How fair is this? How realistic?